Srihari Naidu is Director of the Cardiac Catheterization Laboratories and Director of the HCM Center of Excellence at Westchester Medical Center. He is also an associate professor of medicine at New York Medical College. 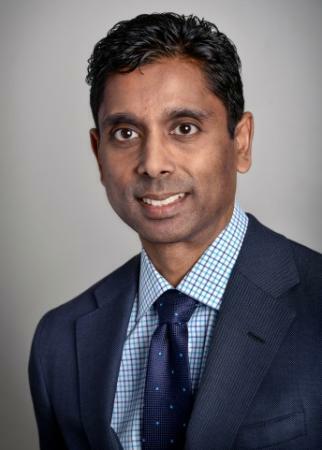 As a recognized expert in hypertrophic cardiomyopathy (HCM), the most common cause of sudden cardiac death among athletes, Naidu runs a multidisciplinary and multi-center hypertrophic cardiomyopathy center, with offices in both Westchester and Long Island, edits the international textbook dedicated to this disease, and is an author on the 2011 American Heart Association/American College of Cardiology HCM Guidelines. He is also a busy practicing interventional cardiologist, who has pioneered minimally-invasive techniques for the management of heart disease. Naidu earned a Bachelor of Science from Brown in 1993 as a neuroscience concentrator. He continued in the Program in Liberal Medical Education and received his M.D. from Brown in 1997. Naidu has been involved in volunteer service to Brown University since graduation. He has interviewed prospective students to the College and the PLME, houses students as part of the Alpert Medical School’s HOST program, completed a term as president of the Medical School Alumni Association, and is heavily involved in the Class of 1993 alumni activities. Outside Brown, Naidu is involved in national professional societies for both cardiology and interventional cardiology and has been on numerous committees and writing groups for the American College of Cardiology (ACC) and the Society for Cardiovascular Angiography and Interventions (SCAI), for which he is a Former Trustee. He volunteers his time and energy toward national advocacy, quality, and leadership initiatives on behalf of his medical field. He supports the Trevor Day School in Manhattan and his previous hospital affiliation, Winthrop University Hospital, in Mineola, N.Y.